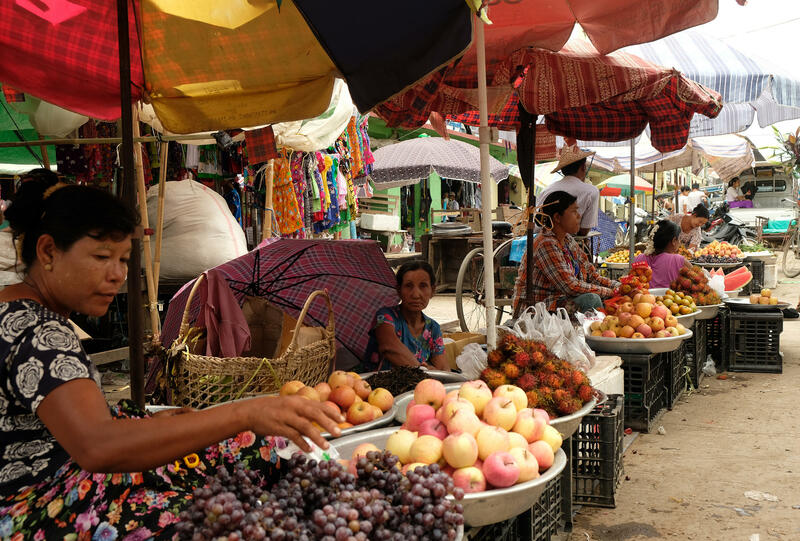 A market on the Strand, a main thoroughfare in Sittwe. Residents of Myanmar's Thet Kae Pyin internment camp for Rohingya wait as a U.S. government delegation visits the camp. Rohingya residents of Myanmar's Thet Kae Pyin internment camp gather outside a school where camp leaders meet with a visiting U.S. government delegation. 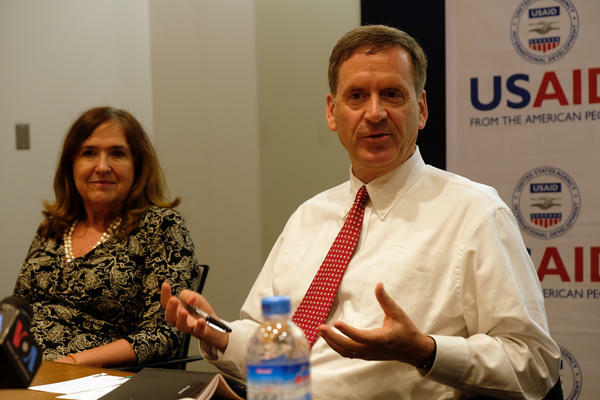 Mark Green, the U.S. Agency for International Development administrator, speaks with reporters at the American Center in Yangon, Myanmar, earlier this month. "So much of what I've seen is, quite frankly, just deeply disturbing," he said after visiting an internment camp for Rohingya. A rickshaw driver and passenger travel in Sittwe, the capital of Myanmar's Rakhine State. The conflict in the state is between two minority groups, the Buddhist Rakhine and the Muslim Rohingya. Both have faced different degrees of persecution during decades of military rule from 1962 to 2016. Tun Aung Kyaw, the general secretary of Myanmar's Arakan National Party, represents the Rakhine minority. 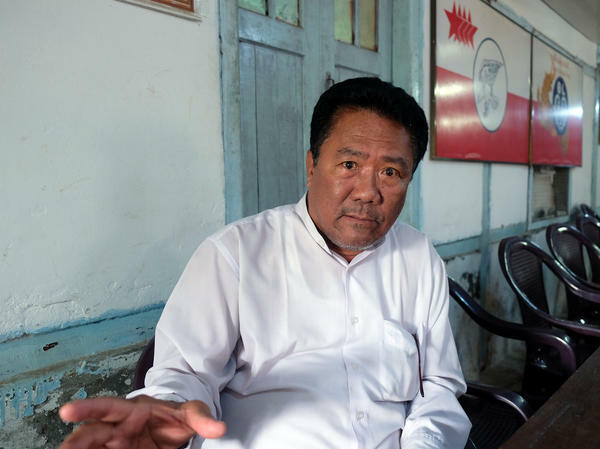 His party swept elections in Rakhine State in 2015. "The central government hasn't done anything for the people or the state's development," he tells NPR. Myanmar state counselor Aung San Suu Kyi awaits a delegation of U.S. officials at the Ministry of Foreign Affairs in Myanmar's capital, Naypitaw. Visitors at a park known as the Viewpoint look out on the Bay of Bengal in Sittwe. The monsoon season is almost upon some of the world's largest refugee camps in Bangladesh. Heavy rains threaten to inundate and cause landslides on denuded hillsides in southeast Bangladesh's Cox's Bazar district, which the U.N. estimates is now home to more than 900,000 ethnic Rohingya refugees. Many of them fled sectarian violence and military anti-insurgent operations — described by the U.S. and U.N. as ethnic cleansing — last year in western Myanmar's Rakhine State. The military operations followed insurgent attacks on police and army posts. It is widely acknowledged as one of the world's worst humanitarian crises. And Myanmar holds the key to resolving it, humanitarian assistance groups and officials believe. Myanmar's government says it is willing and ready to take the Rohingya back. But to many observers, conditions to make those returns "safe, voluntary and dignified," as aid workers advocate, appear to be a distant goal. Even in Myanmar itself, thousands of Rohingya remain confined in internment camps. They are a stateless people. Myanmar considers them illegal immigrants from Bangladesh, but many of them have lived in Myanmar for generations. "When we think about refugee returns anywhere in the world, a leading indicator is what's going on with the population that remains, and also the internally displaced," says Mark Storella, the deputy assistant secretary of state for population, refugees and migration. In most cases, he notes, refugees prefer to return to their original homes. Storella was part of a delegation of U.S. officials that visited Myanmar and Bangladesh this month, in part to assess the feasibility of the Rohingya returning to Myanmar. The delegation was granted access to the northern part of Rakhine State, from which many of the Rohingya have fled, and where entire Rohingya villages were razed. Myanmar authorities did not permit international journalists covering the delegation's trip, including from NPR, to accompany the delegation to the northern part of Rakhine state. But authorities allowed journalists to visit the Thet Kae Pyin internment camp for Rohingya outside Sittwe, the state capital. The camp, home to some 6,000 Rohingya, is fenced in and patrolled by soldiers. Residents live in bamboo and plastic huts, some with metal roofs. The delegation, led by U.S. Agency for International Development Administrator Mark Green, spoke with residents and camp leaders. "So much of what I've seen is, quite frankly, just deeply disturbing," a visibly emotional Green told reporters. "Here, for example, we're looking at all those very young children running around and it suddenly dawned on me: They were all born here. This is the only reality that they know." In the past couple of years, the U.S. has provided nearly $300 million in humanitarian assistance to people affected by conflict in Rakhine State and other parts of Myanmar. "The most important thing that the government can do in the weeks and months ahead is to take concrete steps, to show its seriousness of purpose," said Green. Experts say Myanmar's government has not yet done enough to prepare for the refugees' return. But the government points to several areas where it claims it is making progress on the Rohingya crisis. It has built some dwellings for Rohingya outside the internment camps, which are more permanent than those inside, most of which were designed to last a couple of years. It claims to have housed dozens of Rohingya in transit camps, pending resettlement, after they returned voluntarily from Bangladesh. And it has issued "National Verification Cards" to some Rohingya, which it considers a path to citizenship. But it is not clear where the Rohingya will go after the temporary homes and camps. There are fears among Rohingya, experts and aid groups that those shelters could become permanent. Some observers, including Amnesty International, warn that the military is trying to grab land left by the refugees, making it impossible for them to return where they previously lived. Many Rohingya worry that the National Verification ID cards will relegate them to second-class citizenship, arguing that such IDs are for foreigners entering Myanmar. They also say the cards are being issued to children of Rohingya with citizenship papers, thereby downgrading their families' status. They also find it insulting that to get the cards, they must admit to being "Bengalis" — implying they are illegal immigrants from Bangladesh. Asked if basic services have improved after six years in the camp, since ethnic conflict broke out in 2012, former lawyer and camp leader Kyaw Hla Aung emphatically states: "No. Also, they decrease. From education, from health care, and [on] every side. And economically, there's no improvement." Nor does he see any progress in Rohingya political or legal rights. "I stand for parliament member in 1990 election," he explains. "Now we cannot vote. So where is law and order?" A nominally civilian government stripped the Rohingya of voting rights before general elections in 2015. 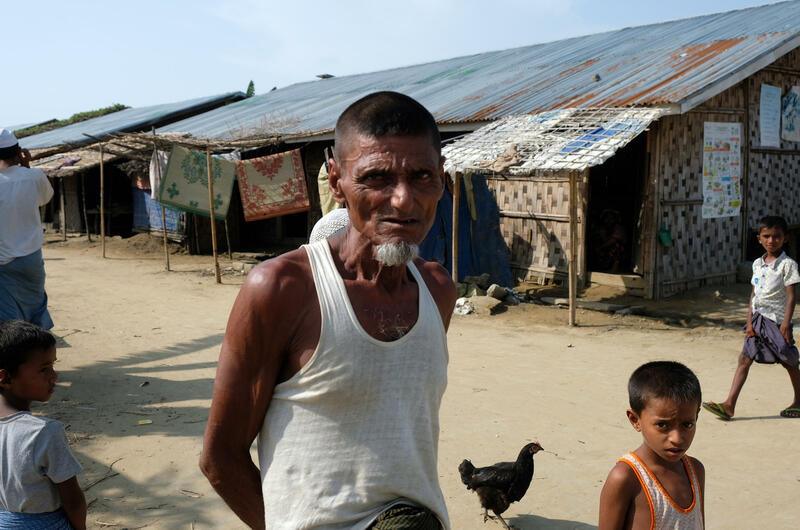 Kyaw Hla Aung warns that a culture of dependency is evolving in the camps, as young Rohingya become accustomed to unemployment and getting their food from international donors. Last year, an official commission headed by former U.N. Secretary General Kofi Annan recommended that Myanmar close the internment camps and give citizenship to all eligible Rohingya. But the repatriation of refugees from Bangladesh appears stalled, with both sides blaming each other for the delays. "We've heard that [Myanmar authorities] support the Kofi Annan recommendations," says Green. "Implement them!" The conflict in Rakhine State is only one of several in Myanmar, where ethnic insurgencies have simmered in its border regions since its independence from Great Britain in 1948. The conflict in Rakhine State is between two minority groups, the Buddhist Rakhine and the Muslim Rohingya. Both groups suffered decades of discrimination and persecution under the former ruling military junta. "No one can deny that Rakhine State is one of the poorest in the country," says Tun Aung Kyaw, general secretary of the Arakan National Party, which represents the Rakhine minority and swept general elections in the state in 2015. "But the central government hasn't done anything for the people or the state's development, using all the foreign investment in our resources." Myanmar has made Rakhine State the southern terminus of a Chinese-invested oil and gas pipeline that traverses the country and delivers energy to southwest China. Like Aung San Suu Kyi's party, the National League for Democracy, the ANP has called for a federal system, giving Myanmar's ethnic minorities on the country's fringes more control over their land and resources. But Tun Aung Kyaw laments that the two parties no longer communicate with each other. "The NLD, with whom we worked together for democracy, has now rejected us," he says. "They have neither asked us for suggestions nor met with us. So for now, we're going it alone, without the NLD." In January, the ANP's former leader Aye Maung was charged with high treason and jailed for his role in a protest marking the Burmese conquest of the independent kingdom of Rakhine in 1784, a date that Rakhine nationalists never forget. Tun Aung Kyaw insists that Rohingya are illegal immigrants and refers to them as Bengalis. But he says they're human beings who deserve basic rights. "If they're legally qualified, give them citizenship," he says. "Don't confine them to Rakhine State. Let them go freely, anywhere in Myanmar." But if they don't qualify for citizenship, he adds, then they should be considered foreigners. The Rakhine crisis seems to have turned Myanmar in on itself, making many in the country feel that foreigners are unfairly criticizing them. Myanmar's military has denied allegations that it committed atrocities against the Rohingya. The crisis threatens to slow Myanmar's economy by dampening the enthusiasm of foreign investors and tourists. Green warns that the crisis also jeopardizes Myanmar's transition to democracy. He contrasts the current situation with that in 2015, when Nobel Peace laureate Suu Kyi's party swept to victory in the freest elections in half a century. Green was an election observer, and he recalls watching as citizens celebrated in the streets of Yangon, Myanmar's largest city. "They were expressing a wide-open enthusiasm for a bright future," he says. "And I think what we're all saying is, that future isn't bright unless this challenge is addressed." By some estimates, at least 700,000 ethnic Rohingya refugees are living in sprawling camps on the Bangladesh side of the border with Myanmar. It's one of the biggest humanitarian crises of our time. Whether or not they can return home depends on conditions in Myanmar from where they fled. NPR's Anthony Kuhn traveled there to see those conditions and sent this report. ANTHONY KUHN, BYLINE: Children are swinging on swings in a playground donated by international aid groups. It's in the Thet Kae Pyin internment camp for Rohingya outside Sittwe, the capital of western Myanmar's Rakhine state. Despite the mirthful sounds, the Rohingya here are not having fun. The camp is fenced in and patrolled by soldiers. People live in simple bamboo and plastic huts. 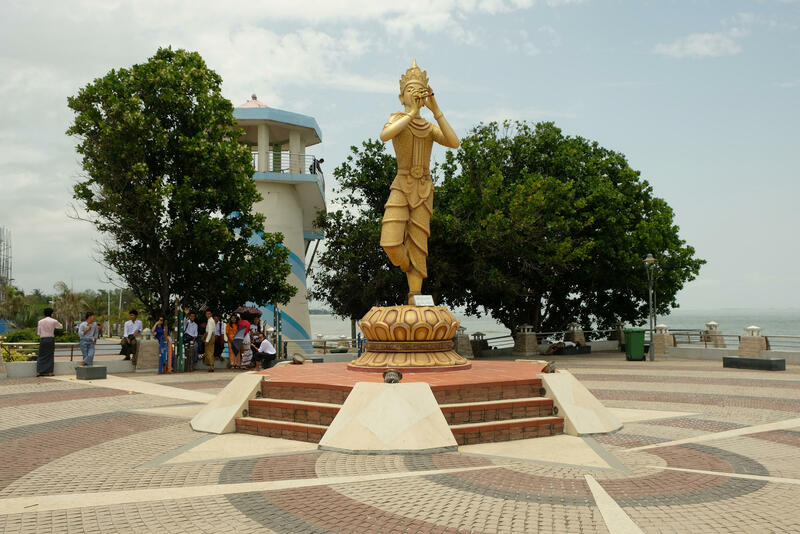 They've been confined here since violence broke out between Buddhists and Muslims in 2012. Security got tighter after Rohingya insurgents attacked police in 2016 and 2017. Military operations against the insurgents sent Rohingya fleeing across the border into Bangladesh. The U.S. and the U.N. have accused the military of ethnic cleansing. I'm at the camp with USAID administrator Mark Green, and he is visibly emotional about what he's seeing. MARK GREEN: So much of what I've seen is quite frankly just deeply disturbing. You know, here, for example, looking at all those very young children running around and such - and it suddenly dawned on me. They were all born here. This is the only reality that they know. KUHN: The Rohingya are a stateless people. Myanmar considers them illegal immigrants from Bangladesh even though many of them have lived in Myanmar for generations. In the past couple of years, the U.S. has provided nearly $300 million in humanitarian assistance to people affected by conflict in Rakhine State and other parts of Myanmar. Former lawyer Kyaw Hla Aung is one of the camp's leaders. You've been here now for six years. KUHN: Has the situation improved any in terms of people's livelihoods or in terms of people's hopes to become citizens of this country? KYAW HLA AUNG: No. Also, they (laughter) decrease from all the side - from education, from health care and every side. And from - economically, there is no improvement. KUHN: Nor does he see any progress in their political or legal rights. KYAW HLA AUNG: I stand for parliament member in 1990 election. Now we cannot vote. So where is law and order? KUHN: Last year, an official commission headed by former U.N. Secretary-General Kofi Annan recommended that Myanmar close camps like this one and gives citizenship to all eligible Rohingya. Observers see little progress on those fronts, and the repatriation of refugees from Bangladesh appears stalled. Mark Green says Myanmar's government needs to be clear about what it's going to do. GREEN: The most important thing that the government can do in the weeks and the months ahead is to take concrete steps to show its seriousness of purpose. We have heard that they support the Kofi Annan recommendations. Implement them. KUHN: The conflict in Rakhine State is actually between two minority groups - the Buddhist Rakhine and the Muslim Rohingya. Both of them have faced different degrees of persecution. Tun Aung Kyaw is the general secretary of the Arakan National Party, which represents the Rakhine minority. He calls the Rohingya Bengalis - in other words, illegal immigrants from Bangladesh. But he admits they're human beings, too, and should have rights. TUN AUNG KYAW: (Foreign language spoken). KUHN: "If they're legally qualified, give them citizenship," he says. "Don't confine them to Rakhine State. Let them go freely, anywhere in Myanmar. If they don't qualify for citizenship," he adds, "then they should be considered foreigners." The Rakhine crisis seems to have turned Myanmar in on itself. It's turned off some tourists and foreign investors. 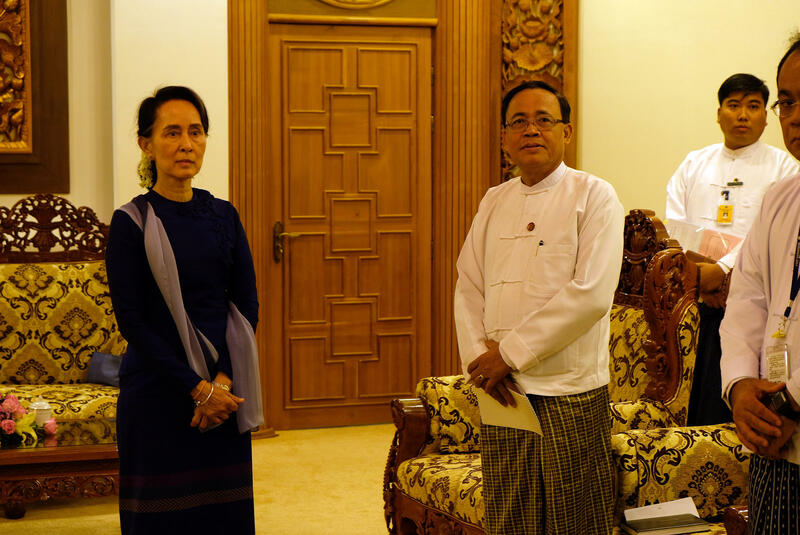 Mark Green warns that it now threatens Myanmar's transition to democracy. He contrasts the current situation with 2015 when Nobel laureate Aung San Suu Kyi's party swept to victory in the freest elections in half a century. Green was an election observer, and he recalls watching as citizens celebrated in the streets of Yangon, Myanmar's largest city. GREEN: They were expressing a wide-open enthusiasm for a bright future. And I think what we're all saying is, that future isn't bright unless this challenge is addressed. KUHN: Anthony Kuhn, NPR News, Sittwe, Rakhine State, Myanmar. Transcript provided by NPR, Copyright NPR.